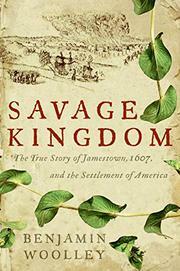 Comprehensive account of the first permanent English colony in North America. Perhaps because its purpose was forthrightly monetary, perhaps because it had the dubious distinction of robustly introducing tobacco and slavery to the country, Jamestown, Va., has never held a place in the nation’s collective consciousness comparable to that of the Plymouth colony. Woolley (The Queen’s Conjurer, 2001, etc.) meticulously gathers and documents all the forgotten details, and while his brilliantly framed narrative remains devoid of any warm, fuzzy uplift, it emerges as fascinating. It’s a wonder the colony survived at all, given its criminal mismanagement, the mutinies and betrayals, famine, disease, withering Indian attacks and the consequent bloody reprisals. Luck surely played a part: Settlers were loaded into ships and just about to abandon Jamestown in 1609, when a longboat rowed up with news of a fleet carrying supplies just arrived in Chesapeake Bay. Certainly, the leadership of tireless explorer, self-promoter and propagandist John Smith was important. Also crucial was the Trinidad tobacco seed planted by John Rolfe, later husband to Christian convert Pocahontas, who made a PR mission with him to England to talk up the colony’s prospects. But the canvas was larger than this tiny beachhead in the New World. Playing a huge, underappreciated role in propping up the beleaguered colony were the reputations and fortunes of the noblemen who established the Virginia Charter and funded the expedition, not to mention the pride of England and the awful prospect of the government abandoning North America to Spain’s Catholic dominion. Woolley effectively establishes this broader context; one of the most engrossing passages here recounts the journey of the Sea Venture, whose ill-fated voyage to Jamestown resulted in the accidental discovery and claim of Bermuda. He illuminates the Virginia colony as part of a larger international game, the stakes of which simultaneously explain and dwarf the sufferings of a few adventurers in a southern swamp. A well-told story of discovery, conquest, business and politics.